It always looks cold in old photos. Stark black and washed-out white. Grim and grainy. Little specks of people stand around in dark coats, bowler hats, and puffed-out dresses, or are blurred into gray shadows beside the boxy cameras they didn't hold still for. They were the 1890s tourists of Glacier Bay, milling around a field of drifted-up icebergs, beneath a formidable wall of ice. It was colder back then. In 2005, U.S. Geological Survey scientist Bruce Molnia lined up his camera to frame the same scene. The picture he snapped was warm, colorful and empty. A barnacle-studded beach beside a turquoise fjord, lined with forest and framed by distant peaks. There are no tourists in this shot, and not much reason for a tourist to snap the photo. The glacier that dominated the first scene, Muir Glacier, has melted back, retreated around the corner and disappeared entirely from the scene. 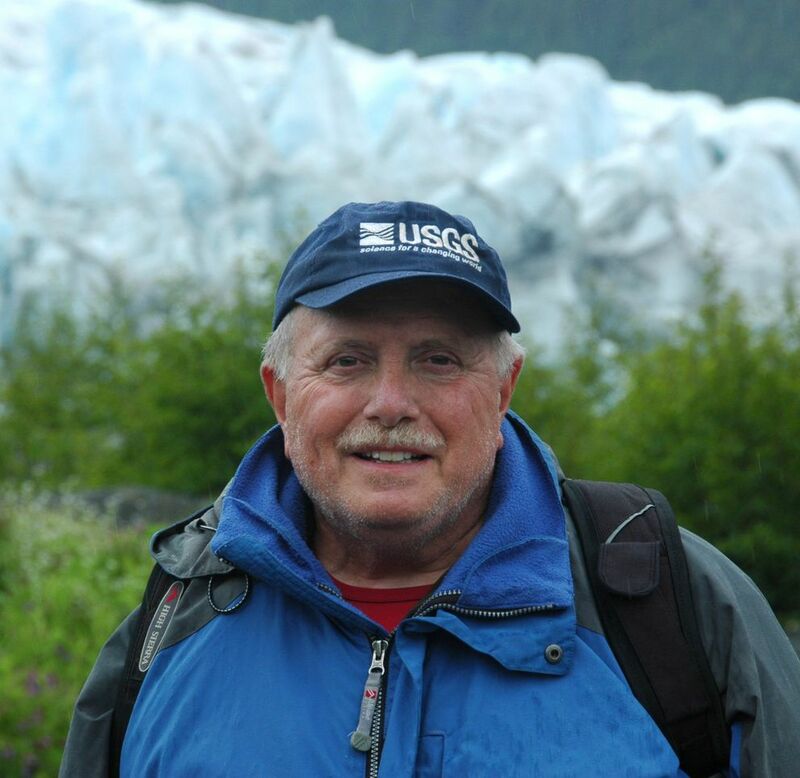 Molnia has been photographing Alaska glaciers since 1968, surprised, even then, by the difference between what he saw on the Juneau Icefield and the historical photos in the Mendenhall Glacier Visitor Center. A glacier begins where more snow falls in the winter than can melt in the summer. The extra snow compacts under its own weight, hardening into ice. Ice piles on ice, growing thicker and heavier until the whole mass begins to creep downhill. Ice melts from the glacier's toe as snow is piled on its head. When a glacier is at equilibrium, snowfall and melting cancel each other out. The glacier flows, but doesn't shift, running in place like a giant slow-motion conveyor belt. When you stand at the toe of a glacier like the Mendenhall, you are looking at a glacier that's been there for thousands of years. But the ice you see may be only 100 or 150 years old. Glaciers are rarely at equilibrium. Shifts in climate — wetter, drier, warmer or colder — change the balance between snowfall and melting. Over years, decades and centuries, even a small change can swell or shrink a glacier by miles. On a geologic time scale, glaciers move fast. The idea of using repeat photography to study Alaska glaciers is almost as old as the first photos of them. In 1910, geologists visited Prince William Sound and Glacier Bay, comparing their pictures to those taken on the 1899 Harriman expedition — studying the motion of the ice. Molnia has those photographs in his database of nearly 5,000 historical glacier images, reaching back to 1883. He gleaned them from historical archives, from professional papers and from eBay, where glacier images pop up for sale in the form of old Alaska postcards. But his project kicked into higher gear in 1998. Then-Deputy Secretary of the Interior David Hayes gave a mandate to a meeting of scientists, exhorting them to search out "unambiguous, easily understood anecdotal documentation that climate change is real." "I thought, what's better than pictures?" Molnia said. "If a picture is worth a thousand words, a pair of pictures — showing change over time — must be worth at least 10,000." Of the 80 glaciers that Molnia has documented, only two or three are advancing. The rest are in retreat, and have been for a long time. Some 95 percent of the Alaska glaciers he's documented have been retreating continuously since the beginning of the study. Other studies confirm what the photos make obvious. From the mid-1950s to the mid-1990s, about 12.5 cubic miles of ice was lost each year from Alaska glaciers. This rate nearly doubled from the mid-1990s to 2001, to 23 cubic miles per year. The advancing glaciers, the Taku and Hubbard, aren't experiencing colder temperatures than the rest. Rather, they are wetter. Their source areas, very high in the mountains, are always cold. The difference now is that it snows more up there. How do you re-take a shot from a 100-year-old postcard? "A lot of the old ones," Molnia said, "aren't even labeled. You have to look at the mountains in the background and try to identify them — just to get the general area." From there, he goes to topographic maps or satellite images, trying to gauge what spot on the map has a line of sight to match the image. Most of the shots only work in clear weather. Then you have to hold the boat steady on the right line of sight, moving back and forth, snapping pictures at a variety of distances to get a match. When he started, his cameras still used film, and he wouldn't know for weeks if he'd gotten it right. Land-based shots can be even worse. As glaciers retreat, plants move in, obscuring the view with lush and leafy thickets. "There was one glacier we were trying to photograph," he recalled, "and we were in a national park, so we weren't allowed to cut anything down. Luckily I had three people with me, and I had them spread out and laying down on top of all the alders, trying to flatten them enough for me to see over." Molnia began the project to look for ice, but what he found most remarkable were the plants. He was surprised by how quickly vegetation grew over barren ice-scoured rock. "You get moss, then brush, then bugs, then birds, small mammals and in maybe only 50 years, you have a forest," he said. On the other hand, the unique ecosystems at the toes of tidewater glaciers, fed by upwelling water and feeding seabirds in their turn, are disappearing. Eighty percent of Alaska's tidewater glaciers are already gone. Our landscape is changing. Our maps are wrong. That was one of the first things I learned in making weekslong treks through Alaska wilderness. Almost as soon as I learned to read topographic maps, I learned where I couldn't trust them. Glaciers that once reached the sea were locked on land. Glaciers that used to spit out into rivers were fronted by murky lakes. I'd look at a white blob marked "Southern Glacier" and end up scrambling through a rocky corridor that deserves a new name: "Southern Glacier Pass." In some places, you can stand beside a glacier, scuff your feet in the silt and realize: "No one has set foot here in thousands of years." The land is newly exposed. No one could have. It's been a year for breaking heat records, like most years are these days. Glaciers are still melting. Molnia doesn't have as much funding as he used to for the project. Some of his sites haven't been re-photographed for 15 years. Glaciers will never be gone in Alaska. Our taller mountains will hold ice as long as there are mountains. Still, it might be a good time to visit those tidewater glaciers, and some of our more accessible glacial toes. Erin McKittrick is an award-winning writer, adventurer and scientist based in Seldovia. She's the author of "A Long Trek Home: 4,000 Miles by Boot, Raft and Ski," "Small Feet, Big Land: Adventure, Home and Family on the Edge of Alaska," "My Coyote Nose and Ptarmigan Toes: an Almost-True Alaskan Adventure." You can find her at GroundTruthTrekking.org.